Round trips to SQL Server kill performance. It takes time to set up the command, get it to the SQL Server, then to parse it, search for and format the results then return them to the application. If you need lots of little pieces of information this can get extremely frustrating, especially when you get a call from your DBA about the “horrible” app that you’re developing. Sometimes you can bring back a super-set of the data you need in one query rather than several smaller queries and you may find that filtering the data down to what you need in code is faster than hitting SQL Server with lots of small queries. It is subjective, of course. There’s always a level in database programming where the theory is fine but you don’t really know until you try it. I found myself thinking that there must be a better way though. There are two scenarios I want to cover – let’s start with the simpler one. Wanting to pass a list as an input parameter to SQL Server is a common problem, and one that I’m pleased to say Microsoft addressed in SQL Server 2005 with table valued parameters. Except that they didn’t implement it in Linq-to-Sql or Entity Framework which proves a bit of a headache. Table valued parameters also need to be in the schema and that’s not always under the control of the app developer. So what do you do if you’re stuck in hard place where you can’t do it the right way? You can of course build up the query text in code to be just like the above but you’d better pray that “Little Bobby Tables” never becomes a customer. Naturally you can use a stored procedure to parse a CSV type string but whilst that’s not so open to a Sql injection attack it’s still pretty fragile. A more robust way is to use XML. Here’s some C# with everything hardcoded so, as long as you have a Northwind somewhere, this should work via the magic of cut-and-paste (and editing the connection string). So we make an XML document in C# – there are any number of ways of doing this, I chose LINQ’s XElement – and passed it to the SQL Command as a parameter. We then use OPENXML to open it as a rowset and inner join it to the target table, allowing us to bring back only the rows we want. Of course there is an overhead in constructing the XML and parsing it in SQL Server and we must be aware of that, but this little trick does allow one to neatly work around some quite common problems. Of course this example is a little trivial. It’ really only to demonstrate a technique. Where XML particularly wins – even over Table Valued Parameters – is that XML does not need to be a list of the same type. You could even specify groups of parameters or a complex structure enabling the SQL Server to make some informed choices about the data to return without having to issue multiple queries and incur unnecessary round-trip overhead. This usually manifests itself when you need data from several tables where there isn’t a one-to-one relationship. If the relationship is simple sometimes it’s quickest to use a join and just throw away the duplicated sections of the row. e.g. you might want a the customer details and their 50 most recent orders – you can accomplish this with a join but you’ll get a copy of the customer’s details with every order details so that’ll be 49 copies of the customer’s details that you don’t need. It may be faster than using 2 separate queries. You can also return multiple result sets from a query or stored procedure. Scott Gu covers that quite adequately in LINQ-to-SQL Part 6. In the above example you could return two result sets, one containing the customers and the other containing the orders. You’d then have to link them in code, but provided there aren’t too many rows this can be a quick option. If it’s details of just one customer that you need you could return one result set (the orders) and use OUT parameters in the query – that’s another option. I mention these options first because XML may not be the right way to go, I’m really just presenting it as an option that you could take. To that end let’s look again at the Northwind database – perhaps we want to bring back a lot of information about a customer, maybe the orders they’ve placed and what was in those orders. This is a hierarchical data set, of course we could do this with multiple result sets but we’d have to join them up on the client side and that could get messy. Instead we can use SQL Server’s ability to output XML. Of course batting XML around the place instead of nice binary types is going to incur a significant overhead and that should be taken into account, but there is potential here. The cunning bit here is using SQL Server’s subquery ability to produce a hierarchical XML dataset. The root node is “Customers” containing multiple instances of “Customer”. Each Customer contains an “OrderDetails” element which is a list containing multiple instances of “OrderDetail”. This in turn has a “Products” element which is a list of “Product” items. I won’t go into SQL Server’s ability to produce XML in any great deal suffice to say that it’s come a long way since 2005 and it’s now really quite powerful. I also accept that there may be better ways of achieving the above. What I do need to mention is how to get this back to a C# app – don’t be tempted to use ExecuteScalar() – it will truncate long xml. The following uses XmlReader which is in turn used with an XmlDocument. This is the asynchronous model which allows a little more responsiveness in the GUI, but does mean a lot of Dispatcher.Invoke(). What I did with the above was to bring it back straight into a WPF GUI and use WPF’s ability to databind directly to XML. Then curiosity got the better of me. I copied the app and produced a version that was almost identical, but used Linq-to-Sql and bound directly to the object model. In use there doesn’t appear to be too much difference between them. I think the XML version is slightly faster but I accept that I may be biased. We’re dealing with a very small data set on a local server however so it’s not really surprising that there’s no immediately obvious difference. To get some results we have to look at SQL Server Profiler. 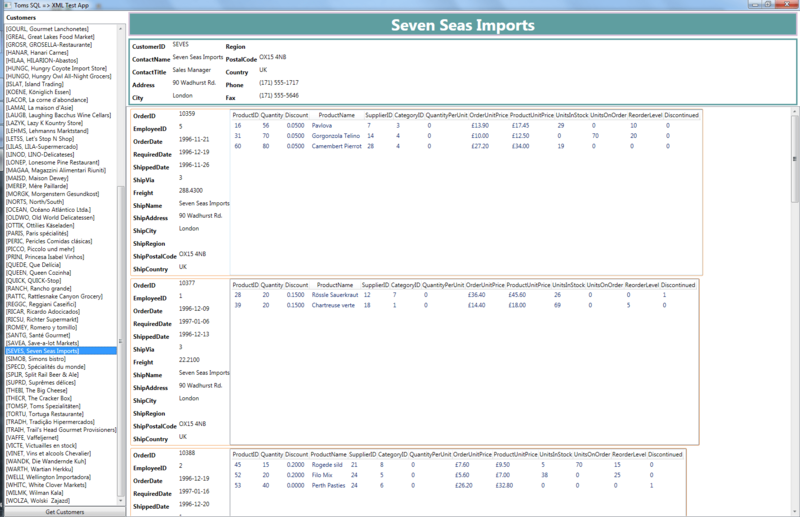 So I made sure that I did the same repeatable action – I first loaded a list of all the customers and then I selected just one customer, Seven Seas, for display. The differences are remarkable. What we can see here is Linq-To-Sql issuing a rash of tiny queries to pick up lots of individual pieces of information. The real conclusion is that I probably didn’t pick a great example. It’s clear however that the approach of Linq-to-Sql and my XML based method are polar opposites, the former hitting Sql Server with a rash of small queries, the latter with fewer, much larger ones. Even on local servers round trips cost and I suspect that as the number of users increased and the size of the data increased the performance of the Linq-to-Sql version would start dipping much faster than that of the XML based version. In the production environment I tend to use multiple result sets because it generally works out cheap to rejoin them on the client side. It’s nice to know however that XML is sitting there in my back pocket, giving me an alternative. This entry was posted in Technology on 2014-02-06 by Tom Fosdick.